Composer and Clarinetist Philip Lipton will perform his original compositions at a FREE concert that will be recorded live from the St. Andrews Presbyterian Church in West Ashley. Philip Lipton is Principal Clarinet of the North Charleston POPS! Orchestra and teaches Clarinet at the College of Charleston. Circular breathing, looping and extended techniques have allowed him to explore fresh new avenues of writing and performance. Collaborators on this new performance include Eastward Music and Lisa Alvarez. Donations will be accepted. Carmina Burana will feature 150 singers from The Charleston Symphony Chorus, 60 plus musicians from The Charleston Symphony Orchestra, and three guest vocalists, alongside 28 dancers from Nashville Ballet. Based on a collection of poems written by clergy and theology students in the 11th, 12th and 13th centuries, Carmina Burana examines love, fortune, and the cycle of life. The ballet is set to the iconic music of German composer Carl Orff written in the 1930s. The opening piece, “O Fortuna”, has made its mark as one of the most recognizable pieces of music in the world. Nashville Ballet is the largest professional ballet company in Tennessee. Nashville Ballet presents a varied repertoire of classical ballet and contemporary works by noted choreographers, including original works by Artistic Director & CEO, Paul Vasterling. Beginning with its first 30-person orchestra in 1819, the Charleston Symphony Orchestra continues to perform major concert series, including Masterworks, Pops and Chamber Orchestra, offering audiences rich, diverse performances. Pre-concert conversations by the Music Director or his assistants are held from 6:30-7:15pm prior to each Masterworks performance from the stage. Founded in 1997 by Baroque scholar and harpsichordist Andrea Marcon, the Venice Baroque Orchestra is recognized as one of the very finest period instrument ensembles. The Orchestra has received wide critical acclaim for its concert and opera performances throughout North America, Europe, South America, Japan, Korea, Taiwan, and China, and has appeared in many more cities across the United States. Committed to the rediscovery of 17th- and 18th-century masterpieces, under Mr. Marcon’s leadership VBO has given the modern-day premieres to amazing works. Series tickets on sale now! Please contact the Ticket Office at 843.242.3099 orticketing@gaillardcenter.org for more information. George Gershwin and Leonard Bernstein captured New York City’s essence and became the iconic musical voices of their time. The CSO is joining orchestras around the world to celebrate Bernstein’s Centennial this season with his Overture to Candide, West Side Story Suite No. 1, and Symphonic Dances. We will then join forces with College of Charleston piano professor, Paul Sánchez, to perform Gershwin’s popular jazz classic, Rhapsody in Blue. 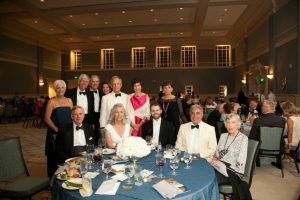 Join the Charleston Symphony Orchestra League, Inc. as we continue a magical evening in celebration of the CSO and the music of Bernstein and Gershwin. Enjoy festive foods reminiscent of the streets and neighborhoods of New York City, while mingling with patrons and musicians and browsing unique silent auction items in the Grand Ballroom of the Gaillard Center. A limited and exclusive live auction of select items of interest will cap this very special event. It won’t be just any night…. Charleston Symphony Orchestra Pops presents CSO’s Annual Holiday Pops. Festive fun for the whole family! Join the CSO and the CSO Chorus for our annual holiday celebration! Principal Pops Conductor, Yuriy Bekker, leads this family-friendly holiday tradition that will feature “White Christmas,” “Klezmer Nutcracker,” “Ave Maria,” “12 Days of Christmas” (CSO-style), Leroy Anderson’s “Sleigh Ride” and many more sing-along favorites. The Charleston Children’s Chorus joins us, as well as special surprise appearances. Tickets to Nutcracker will go on sale to the public on Friday, September 1, beginning at 11am. Celebrate the magical sights and sounds of the holidays at Charlotte Ballet’s Nutcracker! Join us on a holiday voyage complete with choreography by Jean-Pierre Bonnefoux, live music, and the professional dancers of Charlotte Ballet joined by student dancers from the Charleston community. This treasured holiday tradition was made even more magical in 2016, when it premiered with all new sets and costumes. Whether it’s a treasured family tradition or you’re experiencing it for the first time, Nutcracker promises magical holiday memories for years to come!